I really appreciated all of the comments I got from the blog hop and through e-mail. I wish I had the time to for a tutorial but time is something I lack. Someone could get rich if they could bottle time and sell it because so many are looking for more of it. I've had quite a few e-mails with questions on various aspects of the box and I've been responding to them as they come in. I thought I would post some of the answers here in case anyone else is trying to make it. Question: How did you cut the DP for the box? Answer: I'm sure there is an easier way than what I did but this is what I did. I cut a petal cone on scrap paper and cut at the score line and then proceeded to cut the other edges so I was left with one panel. I then cut off from each side 1/8". I used that as a template. I'm happy to share this cute box with you today. I saw a Halloween themed one that I thought was darling. I wanted to make something similar and this provided the perfect opportunity. I didn't secure the poinsettia on top because I don't have anything in the box but you get the idea. 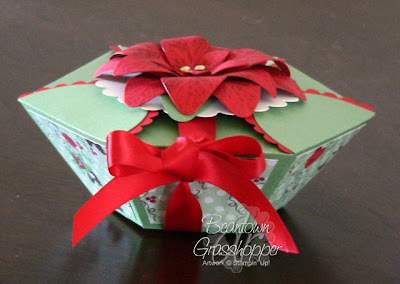 I used the Petal Cone die and cut three of the cones for this box. Every other flap has the red scallop border.